Galaxy Alpha: What is Geo News, and how do I use it on my Samsung Galaxy Alpha? Geo News is a location-based service that alerts you of severe weather conditions and incidents in your area. In an urgent situation, you can call your primary contacts or send text messages with your approximate location. 3. Touch Safety assistance . 5. Touch the slider to turn Geo News on . 6. Review the Terms and conditions, mark the acknowledgment checkbox, and then touch OK. Touch OK on the Use responsibly screen. 7. Mark the Geo News notification pop-ups checkbox to receive warnings as pop-ups on your Home screen. 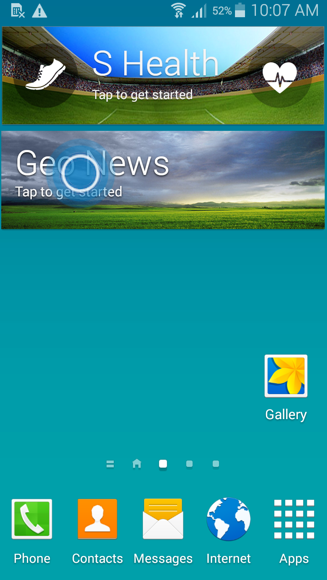 To access Geo News, from the Home screen, swipe from right to left until you see the widget. If you removed the widget, touch and hold the Home screen, and then touch Widgets at the bottom of the screen. Touch and hold the Geo News widget, position it on an available screen, and release it. Additional information about Geo News is available here.